Antioxidants play an important role in maintaining balance within the body. These nutrients protect the body’s cells from damaging free radicals which are accumulated as a result of daily life. 1 If the body does not have enough antioxidant reserves to combat the onslaught of free radicals, then cell damage can occur. Over time free radical damage may contribute to many of the degenerative diseases we are faced with today. Keep reading to learn more about how antioxidants may help protect your body from disease. Fruits and vegetables are rich in antioxidants. An antioxidant is a substance that is capable of counteracting the damaging effects of the process of oxidation. 1 Antioxidants come in many different forms such as: vitamins, minerals and enzymes. Some examples of well-known antioxidants are: beta carotene (vitamin A), vitamin C, vitamin E and the mineral selenium. Fruits and vegetables are an excellent source of antioxidants in your daily diet. What does all this talk about antioxidants and free radicals mean? A diet rich in antioxidants might be better than health insurance. Antioxidant rich foods will protect cells and prevent pre-mature aging. Which foods are rich in antioxidants you ask? 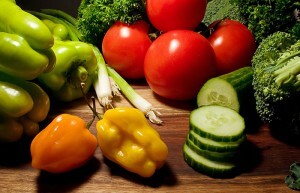 In general, fruits and vegetables are frequently seen at the top of the list. 3 Also, here is a list of the twenty most antioxidant rich foods. Our Legendary Colloidal Minerals are an impressive scavenger of free radicals (free ions). They are many times more effective than most nutritional supplements in binding with and removing harmful particles. Please beware of companies that claim to sell you a bottle of ionic minerals (free radicals). When you buy T.J. Clark’s Liquid Trace mineral formula, you get a minimally processed product that comes from nature. We believe that mother nature knows best. In the end antioxidants play a part in keeping us healthy and looking younger. As we age, our antioxidant needs will most likely become greater. 2 So make sure to eat a diet rich in fruits and vegetables, and for extra insurance take T.J. Clark’s Legendary Minerals. Remember that an ounce of prevention is worth a pound of cure. How Antioxidants Work. Robin Brett Parnes. How Stuff Works. Understanding Free Radicals and Antioxidants. Health Check Systems. Best Food Sources of Antioxidants. Cathy Wong. About.com: Alternative Medicine.